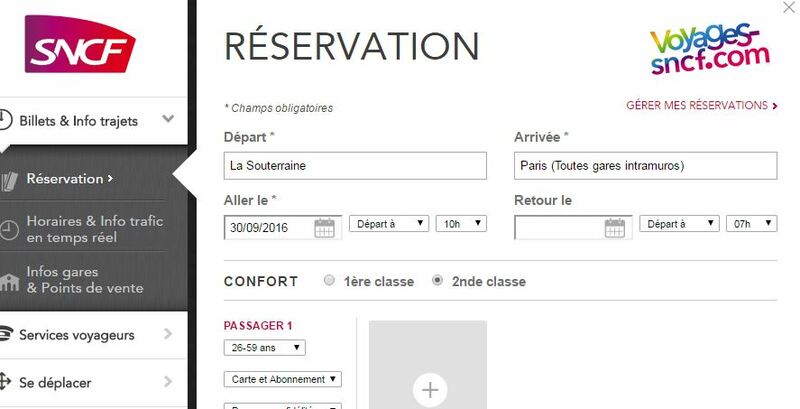 I am considering booking a train from La Souterraine to Paris CDG on the last day of September however when looking at SNCF trains online it appears that it is too far in advance, can anyone help? Does anyone have any other suggestions to get to the airport for around lunch on a Friday? Other suggestion: retry your reservation. I tried the French, Dutch and German Deutsche Bahn websites, no problems. In the French SNCF version go to réservation and change the calendar option in "Aller le" to September. Result: several possibilities. Sadly, the direct TGV service which stopped at La Souterraine and CDG ended in April, so the only way to do this is via Paris Austerlitz, - which route you then choose will depend on how much luggage you have !! Re you comment about luggage, I have noticed it says you have to walk for a connection, is it far and whats the walk like? Though I've not done this for a few years, I doubt it's changed---the walk from the quai where the train from La Souterraine arrives to the RER C stop (from whence one takes the RER B3 to St Michel--one stop) is not difficult, and there are (or were) escalators and/or moving sidewalks. Likewise, to get to the RER B train which goes from St Michel up to CDG is straightforward--be sure you get on the correct RER B train, not all of them go to CDG, and there are two CDG stops, first at terminal 1, then at terminal 2. Once at the RER terminal in CDG, there are free navettes and trains which serve the various CDG terminals if need be. If your luggage has wheels, you're unlikely to have to struggle too much. Everything is quite well marked. Try to avoid making any connections at rush hours if you can; though the RER B which serves CDG does have (en principe) space for luggage, it gets very crowded then.